Help ESL and Mainstream students improve their written and spoken language by adding details, specificity and techniacal/academic language. 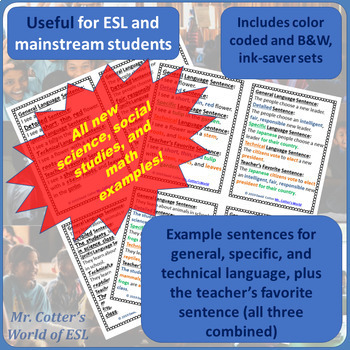 Student friendly examples created by an ESL teacher in a non-English environment (Taiwan) with never fewer than 4 native language backgrounds per class. 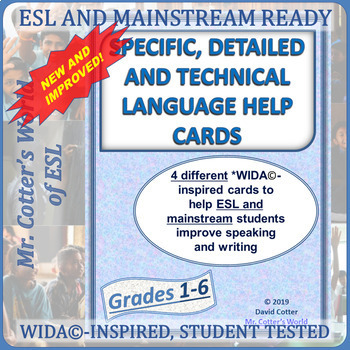 These cards are based on WIDA concepts of general, specific and technical language and will help your students improve their speaking and writing quickly! Print, slice and laminate the cards. 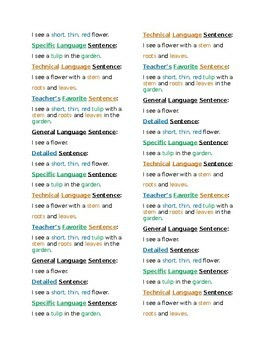 Provide them to students as a useful reference for any and all writing and speaking projects. You can even use them as a basis for a series of lessons (they evolved out of a series of WIDA-based lessons in my classroom, after all...). 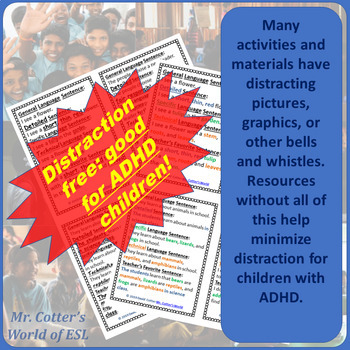 ESL students can use these during listening activities. For example: Have ESL students do show and tell or a short presentation while others listen. After each student's turn, students discuss ways to help each other improve their presentation using the tips on the cards.